Click on the map image to launch full-size, interactive map. When you select an individual room or kiva context on the larger map, a pop-up window will appear displaying information categories from our database available for that context (Artifacts, Burials, Tree-Ring Dates, and Features). Each of the categories can be expanded by clicking the ‘+’ to reveal an abridged list of basic information. Selecting the category heading itself will open a separate window with complete details. Talus Unit is a small structure composed of an east and west building located against the cliff behind the back wall of Chetro Ketl. Two rooms connect the buildings, which rise three-stories at the cliff base and terrace towards the front. Tree-ring dates indicate construction mainly occurred between A.D. 1060-70, although lintels from a single doorway in the east building date to the early 1030s. The rectangular west building included approximately 20 rooms and five kivas and resembles an expected early stage in the construction of great houses in the canyon. Thus the structure may originally have been a part of Chetro Ketl. Several McElmo-style kivas may have been added to the room block later. 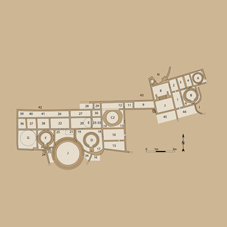 The east building is smaller, containing only eight rooms and two kivas. Two of these rooms may have served as landing for ladders providing access to a stairway in the cliff. These steps led to a road connecting with Pueblo Alto. In addition, steps in the east building provided access to the ladder landing. The presence of these features has raised questions as to the function of Talus Unit. Alternate site designations include 29SJ1930, LA 2470, and Bc 257. 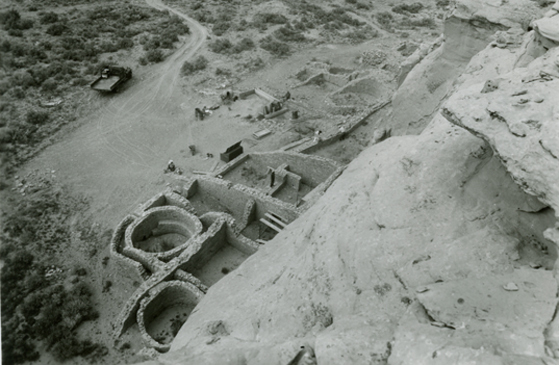 1959: Kiva J later excavated by Joel Shiner of the National Park Service. Approximately 30 rooms and seven kivas.